Gabriel Metsu was born in Leiden a few months before the death of his father, the Flemish painter Jacques Metsu. Houbraken, the biographer of Dutch artists, states that Metsu trained in his native city in Gerrit Dou’s studio. The artist was one of the founder members of the painters’ guild in Leiden and registered in that association in 1648. According to guild documents Metsu was away from the city between 1650 and 1652, when he was probably working in Utrecht. 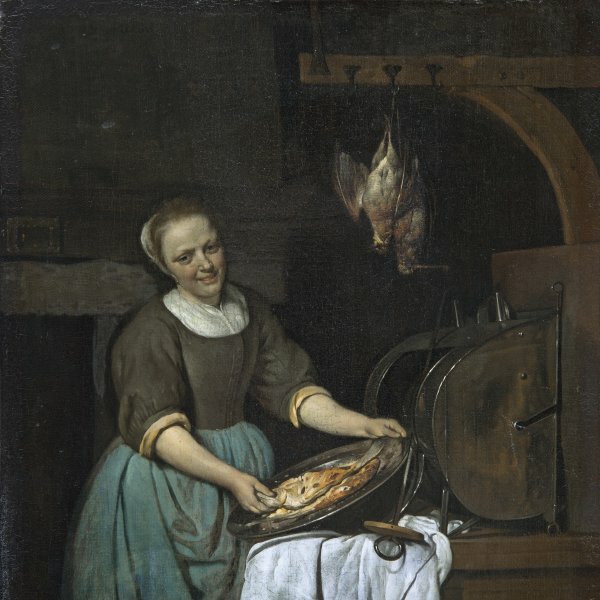 In 1657 he settled permanently in Amsterdam and the following year married Isabel de Wolff, who was related to the Grebber family of artists. The chronology of Metsu’s works is difficult to establish as most of the approximately 150 paintings attributed to him are not dated. During his early period, covering the years in Leiden and Utrecht, he painted large-format compositions of a narrative type and scenes of blacksmiths’ forges, which was a popular subject among Utrecht painters. These works reveal the influence of Nicolaus Knüpfer and Jan Baptist Weenix. Following his return to Leiden in 1652 he began to paint scenes of interiors that use a window and a candle as their principal source of illumination, in a manner comparable to Dou. A second phase in his work is evident from 1657 when Metsu moved to Amsterdam. Domestic interiors became his preferred subject although he also executed portraits, still lifes and hunting pieces. Metsu’s technique at this date became more refined and he placed more importance on details such as the textures of the clothes. The cool palette and the style of his mature works reveal the influence of Johannes Vermeer, the great Delft master, whose compositions clearly inspired paintings such as Man writing a Letter and Woman reading a Letter (both National Gallery of Ireland, Dublin). While Metsu’s works never lost their individuality, he was capable of assimilating the motifs and solutions of the great masters of genre painting such as Dou, Ter Borch, De Hooch, Maes, Steen and Vermeer. His only known pupil was the portrait and genre painter Michiel van Musscher.